Today, U.S. 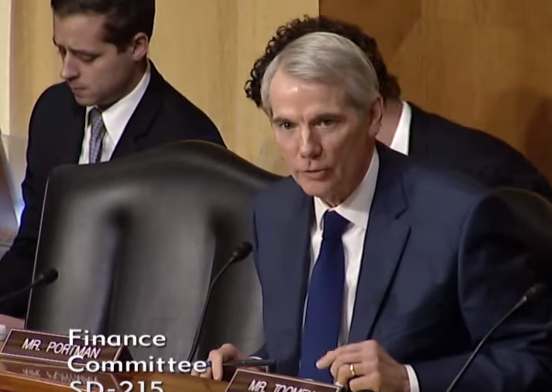 Senator Rob Portman (R-Ohio) urged action on his bill to address the heroin epidemic in Ohio. In a Senate Finance Committee hearing, Portman highlighted how the overprescribing of pills has contributed to the heroin epidemic in Ohio. Portman also urged action on his bill, the Comprehensive Addiction and Recovery Act, which will help to combat drug addiction. “With regard to the lock-in program, this is critically important for Ohio and other states right now. As you know, we have this heroin epidemic, on average, we are losing 20 people a week in Ohio to opiate overdoses, most of it is heroin. “Most of it started with prescription drug abuse so what we are trying to do is make it harder for people to be overprescribed, both because we don’t want them to be able to sell those pills on the street, but also importantly, so they themselves don’t become addicted. Portman has spent his time in Congress working to fight drug abuse. He is the author of the Comprehensive Addiction and Recovery Act of 2015, legislation designed to provide new resources and incentives to address addiction and promote recovery. It uses evidence-based tested methods to expand treatment while increasing educational efforts aimed at teens, parents and other caretakers with the goal of stopping drug abuse before it starts. He is also the author of theStopping Medication Abuse and Protecting Seniors Act which will prevent inappropriate access to opioids and improve patient care for at-risk beneficiaries. Portman also wrote the Drug- Free Communities Act which was signed into law and has provided millions of dollars of support to hundreds of community anti-drug coalitions round the country.